There are 3 types of dress codes that you can face at your workplace. The first one is when you don't have any dress code at all. This means that you can wear whatever you want to wear. By the second one you need to wear a uniform - in fact always. This can be provided by the company you are working at, or it can be agreed in for example wearing only jeans and black T-shirts at work. The third type of dress codes is - I think - the most challenging and most expensive of all. This is where you need to dress up formal. When you are given a uniform or you can wear the clothes, you are wearing anyway, there is no extra spending. But if you need to wear a different look at your workplace, then you need to invest in a whole new wardrobe - beside your own one of course. This is why I prefer clothing that somehow turns out to be 2-in-1. Tops which paired with jeans look casual, but with black trousers already elegant. Or dresses that worn with sneakers are great for a walk in the park but with high heels they just look perfect for a meeting. 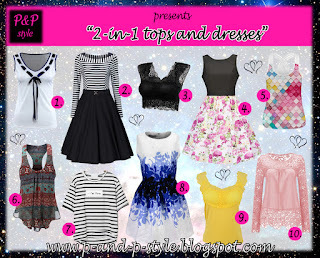 Below I collected some women's skater dresses and tops which could easily fit into the mentioned two-in-one wardrobe. Wear the shirts with jeans for a stroll in the town or with elegant trousers at the office. The shoes and accessories can make a big difference here. They make you able to create the outfit you want to achieve. Choose one from the picture above or find other cheap women's tops at FashionMia and dress them up or down after your fancy. Great tips and gorgeous picks! All the pieces is great!! These is good selection!! Thanks for sharing!! Nossa! Que lindas essas peças *. * Amei!